The rainout gave me some time to update the Durham Bulls hitters tables to the 40 (actually 41) game point. What’s changed since our last look? First of all, new guy Curt Casali is at the top, but the sample size is really small, so let’s wait a while. Eddy Rodriguez, who was at the bottom last time, has been released. Cole Figueroa, who just went up to the Rays, moved from second place to first. Kevin Kiermaier’s wRAA improved from 3.0 to 6.1. Jerry Sands slipped slightly off his very hot start from 10.5 to 7.1. Another important change over the last 20 games is Vince Belnome’s growth from .237 to .310. Hak-Ju Lee is new to the team and we are going to have to just wait and see how he goes. Ray Olmedo has slipped some, but he (and Ali Solis) remain keys to the defensive strength of the team. As a help for understand what these numbers mean, take a look at this table adapted from FanGraphs that characterizes wOBA numbers. You can see that almost all the hitters are in the “Above Average” category. Lastly, a picture. Can't have a bunch of numbers on WDBB without a picture! 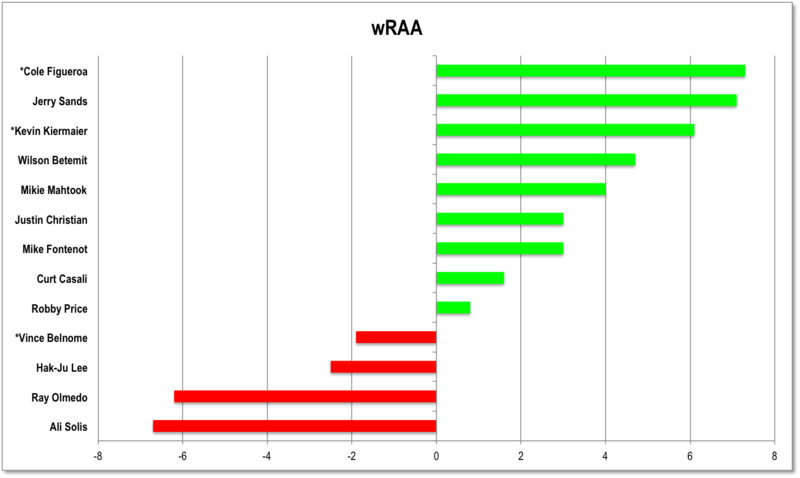 In this case it is a simple chart of the wRAAs from the table above. Click on it for a larger view.